Gorgeous Original Luxury Wedding Anniversary Card. Our luxury and supersize cards are 210x148mm in size and are made of 350gsm card and completed with a 160gsm quality white insert. All cards are teamed with a colour coordinated presentation envelope. Our regular cards are 148x148mm in size and are made of 350gsm card and completed with a 160gsm quality white insert. All cards are teamed with a colour coordinated presentation envelope. Please review our list of Frequently Asked Questions. All orders choosing the 1st class delivery option, will be dispatched within 2 working days. Next day delivery is available if orders are placed before 1pm and Special Delivery postage is selected. 1st Class Royal Mail normally arrives within 1-3 working days from the dispatch day. We offer a next day Special Delivery service if your order is placed before 1pm. If a Special Delivery order is received after 1pm it will be processed the following day. If you have missed the 1pm deadline and need an urgent card for next day Special Delivery please email us your request via our contact form as we can sometimes accommodate late orders. All orders are dispatched by Air Mail. Your order normally takes 3-5 working days to arrive from the day of dispatch for Western Europe and within 5-7 days for Eastern Europe. All orders are dispatched by Air Mail. Your order normally will arrive within 5-10 working days from the dispatch day for the rest of the world. Personalising our cards is FREE OF CHARGE, we do not charge extra for this service. When personalising the front of our cards, the text you provide us will appear as shown on the demonstration card. You will not have a choice of fonts and you should follow the layout shown on the demonstration card, keeping the name/s if applicable on the same line for the ornate font. Personalisation for the front of your card is a required field, if you would like your card the same as the demonstration card or the same but with different name/s and date, please indicate this in the personalisation box. As our cards are handmade and not computer generated, you will not get to see a screen preview of the front personalisation. You can have your own message printed on the left and/or right side of the insert and you will have a choice of fonts and font sizes. When typing, your text will appear in the larger frame, this is the frame that shows how your message will appear in the card insert. It is most important that you check your spelling, punctuation, grammar, capitalisation and layout. Your text will be printed exactly as you supply it and will be centred in black print. We recommend you do not use full capitalisation when using ornate fonts as it is illegible. Character limits apply to your text, please check the wording is correct before confirming your purchase. Our cards are available in two sizes, luxury and supersize 210x148mm and regular 148x148mm, these can you chosen from the drop down menu. Luxury cards only come in one size. Our cards are made from thick 350gsm smooth, white card and are completed with a 160gsm premium quality, white insert. All our cards are supplied with a presentation envelope and are posted to you or direct to the recipient, inside a double board envelope for the cards protection in transit. Our great selection of unique personalised handmade wedding anniversary cards are the perfect way to convey your best wishes and congratulations to the happy couple. 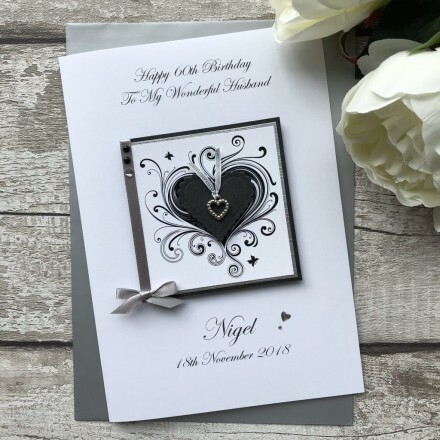 This card features an original gorgeous handmade card featuring a stylized heart with silver coloured heart charm and is finished with pearls and diamantes for the ultimate touch. This handmade anniversary card is teamed with a matching square envelope, protected in a sealed cellophane bag and sent to you in a double board outer envelope to ensure it arrives in pristine condition. Should you be unsure about how to personalise your card, please visit our frequently asked questions page as this page will help you gain a greater understanding on how personalisation works. If however once you have viewed the page you still have questions, please do not hesitate in getting back to us. We are always happy to help you create a card that is perfect for your needs. PERSONALISE FRONTPlease add your text in this box. Your text will appear on your purchase as shown on the demonstration card, you will not have a choice of font. Please keep your message in this box to the same layout as shown. Keeping names if applicable on the same line to appear in the ornate font. It is important not to leave your personalisation in full capitals, especially when typing names as these are often printed in the ornate fonts that are illegible in full capitals. PERSONALISE INSIDE LEFTPlease make sure your message fits within the personalisation box to the left. If necessary change the font size. Ensure you are happy with the spelling and text layout, as your personalisation will be printed as you see it, in black and centralised. PERSONALISE INSIDE RIGHTPlease make sure your message fits within the personalisation box to the right. If necessary change the font size. Ensure you are happy with the spelling and text layout, as your personalisation will be printed as you see it, in black and centralised. Our beautiful and comprehensive collection of eye catching designs cover birthday to wedding cards, christening to anniversary cards that offer a unique blend of stylish and traditional designs, whatever the occasion we are always delighted to hand make a special card for you to give to someone to cherish. We have worked hard to make ordering and personalising your card as easy as possible. Each card has an area where you can choose a colour choice if applicable and add a personalised message to the front, the font will be as shown in the demonstration picture of the card. You will not have the choice of font in this personalisation box. You should choose wording similar in length and layout shown. It is especially important that you keep the names on the same line as shown, for the ornate font. We may need to amend your wording to fit with the card layout if your message is not possible. As our cards are handmade and not computer generated you cannot see a preview. Your card will appear as shown in the demonstration picture but with your personalisation added. You can also personalise the insert on the left and right and have a choice of fonts to use. We recommend that you do not leave your personalisation details in FULL capitals as your request is not easy to apply to your order and should not be in capitals unless that is the way you would like it to appear. It is also not possible for us to see where you would like the capital letters in your details when your supply them all in capitals. We recommend you visit our Frequently Asked Questions page, as this has many answers to questions you will find helpful and will give you a clearer understanding of our service.